Standing Rock, the largest uprising of indigenous people that our generation has seen, is what the future looks like. Tribes who have had centuries-long divisions have entered into a space of forgiveness and love with their shared mission: saving mother planet, saving her water. The people at Standing Rock are incredibly welcoming. Seven massive kitchens serve three hot meals a day to any and everyone living at the encampment. Standing Rock is a role model of the future. These incredible indigenous leaders are putting their lives and bodies literally on the line in the fight for a better world. One message was very clear: they are not going anywhere. After we toured around the first day, we met some organizers who were meeting with the parents of children at Standing Rock. They were organizing a parent meeting to make sure that every child at Standing Rock would receive a quality education. They were collecting school supplies and by the time this article is published school will be fully in session. The community of warriors were surrounding their comrade who was being locked onto one of the machines. This machine had just dug up a sacred burial ground during a sneak attack in the middle of the night. DAPL workers dug up the exact coordinates that were reported to them, and requested to be respected. This is a major human rights violation, especially considering the mass genocide that the indigenous people in this land that we call America have endured for centuries. Jill Stein and Ajamu Baraka, the Green Party presidential and vice-presidential candidates, were invited by some of the leaders to chain themselves to one of the machines. This request is not to be taken lightly. When people engage in this kind of direct action they risk being beaten, pepper sprayed, or worse. When asked to spray paint a message on one of the machines, Jill and Ajamu stepped up to stand in solidarity with the people. Ajamu spray-painted “We must decolonize.” He spoke not as a candidate for Vice President but as a human rights activist from an oppressed community, with the full personal and global understanding of the generational impact of colonization of people of African descent. Jill, when asked to spray paint a message, took the opportunity to center the struggle of Standing Rock by making the statement of the “presidential seal.” She sprayed “I approve this message,” as a sign of solidarity. Jill constantly speaks about the limitations of one single person and even the highest office of this land we call America. Real transformative change happens in the frontline communities like at Standing Rock. Jill and Ajamu have been visiting and working with frontline communities such as Standing Rock, Black Lives Matter Los Angeles (who camped out in front of City Hall demanding that the chief of police Charlie Beck be fired), and the homeless in Baltimore. They are using their platform as the presidential and vice presidential candidates for the Green party as a way to not just uplift but to help unite these struggles. There are powerful forces working to divide the left and when we unite, organize and work together, we becoming exponentially more powerful. What do we have to lose? The electoral process continues to frame the individual and there is a “celebrity” factor that comes into play that we must fight against. 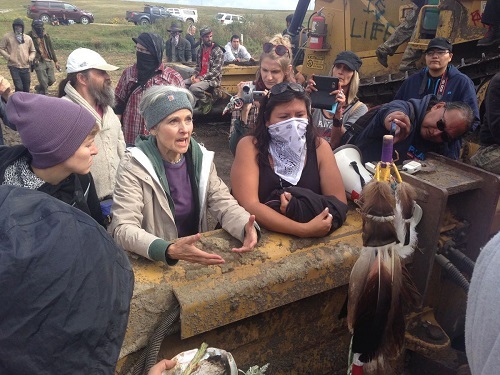 For example, many people heard about Standing Rock from the mainstream media for the first time when Jill and Ajamu visited, and still the reporting has been all about her spray painting on the machine, not the leadership and bravery of the indigenous people leading the struggle. The mainstream media are holding tight to their control of the story. They did not share that Black Lives Matter and Palestinian rights activists were also fighting at Standing Rock. The mainstream media have missed the main point: that there is larger struggle going on. People are developing a larger understanding of intersectionality of our struggles and standing up together and unified. I firmly believe that we are living in a very historic moment, as the people are starting to understand the complex intersectionality of race, gender, class, sexual orientation, ability, and gender identity in the fight for freedom. Standing Rock is what the future looks like if we are willing to stand together, to organize and to fight for it. Alison is a staffer with the Jill Stein campaign and a member of Solidarity. Her views do not necessarily represent those of the Stein campaign.